Buenos Aires | Reuters — The El Nino weather phenomenon is expected to start dumping torrential rains on Argentina next month, pushing farmers to plant more low-cost soy and less corn despite concern over lack of crop rotation in one of the world’s main food suppliers. Argentina, the No. 1 exporter of soymeal livestock feed — which is fuelling a shift in diet away from rice and toward beef, pork and poultry in Asia — expects to get walloped by El Nino-related storms just as sowing gets underway in October. 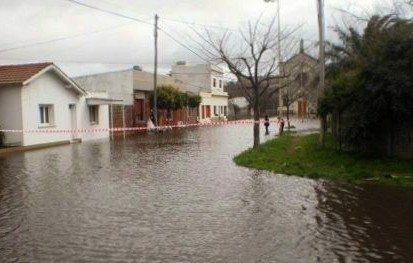 With about a quarter of bread-basket province Buenos Aires already under water due to record August showers, soils may not be able to absorb the rains ahead. This is an additional headache for growers already bedevilled by stiff trade controls and one of the world’s highest inflation rates. “They are likely to hedge their bets this year by planting soy rather than corn, which is relatively expensive to cultivate,” said local farm economist Manuel Alvarado Ledesma. Cheaper-to-grow soybeans have taken Argentina’s Pampas grains belt by storm over the last decade, raising concern that the lack of residual corn stalks and mulch left by other crops is robbing nutrients from soils. Some recently planted wheat has been wrecked by floods and conditions for harvesting in December and January might not go smoothly if forecasts of the strongest El Nino on record come true, said Anthony Deane of consultancy Weather Wise Argentina. The El Nino phenomenon, marked by warmer than usual air above the eastern Pacific Ocean, tends to increase rain in Argentina while causing dry conditions over the Australia/Indonesia archipelago and Southeast Asia. “It’s going to wreak havoc in northeastern, northwestern and central Argentina,” he said. Deane said 40 per cent of Argentina’s main grains belt is on high enough land to avoid flooding from the October through April El Nino cycle, but he expects areas that are not flooded to enjoy very high production. Indeed by eliminating the threat of drought, El Nino could be net positive for corn farmers with access to high-placed land, said Martin Fraguio, head of corn industry chamber Maizar. Argentine farmers are expected to plant 2.72 million hectares with 2015-16 corn, down 20 per cent from the previous crop year, the Buenos Aires Grains Exchange said last month. Reasons for the projected cut include low world corn prices and the exploding cost of seeds and fertilizers in a country where economists estimate inflation at about 27 per cent. Farmers also complain about the corn and wheat export quotas that the government uses to ensure ample domestic food supplies. The economy ministry can raise and lower the quotas throughout the year, making crop planning difficult. Argentina’s leading opposition presidential candidate Mauricio Macri says he would lift the quotas. The front-runner ahead of the Oct. 25 election is Daniel Scioli, who is from the party of outgoing President Cristina Fernandez. Scioli has yet to outline his farm policy platform. “If Scioli wins and promises an end to the export quotas, farmers will probably plant more corn than they expected to in December,” said Alfredo Paseyro, head of the Argentine Seed Venders’ Association, an industry chamber. — Hugh Bronstein is a Reuters correspondent covering Argentina’s commodities and economy from Buenos Aires.